The convenience of built-in effects without compromise of sound quality. The CFX-20 mixer features a 20x4x1 configuration with 16 mic/line mono channels and 2 stereo line channels. The CFX Series mixers boast 32-bit digital EMAC effects that are superior to many outboard units”exceptionally clean and realistic. Effects include 16 selections with variable parameters, including reverbs, delays, chorus, flange, and phaser. 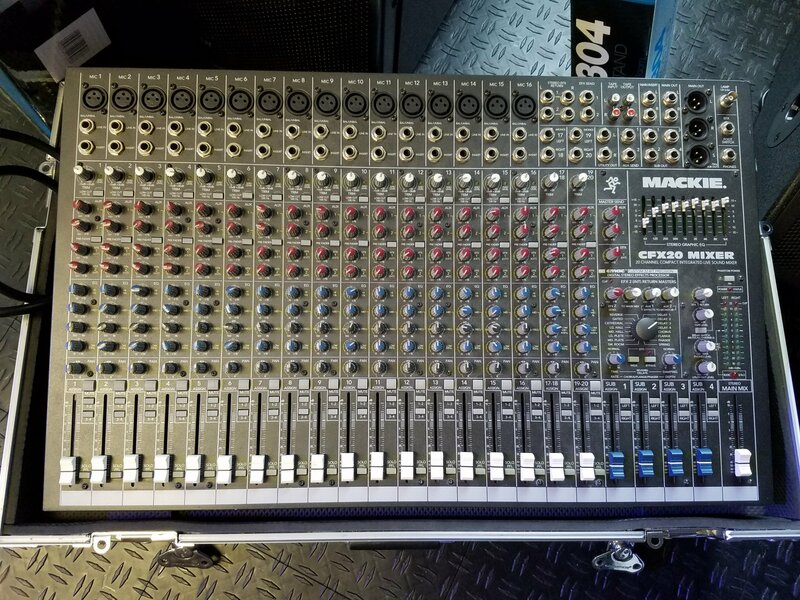 These are built into low-noise, high-headroom mic/line mixers packed with the following features: 3-band active EQ with swept mids on mic/line channels, 4-band active EQ on the stereo channels, 2 aux sends with pre/post switching, internal and external effects level sends, Constant Loudness pan controls, bus assign switches, and PFL solo switches. They also include an audiophile-quality, 9-band stereo program equalizer, separate tape inputs and outputs, and Mackie's studio-quality, discrete mic preamps. All housed in a rugged metal box.